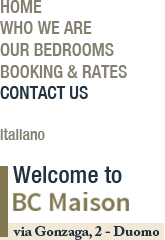 Our BC Maison can be found at Via Gonzaga 2, corner of Piazza Diaz, a few steps away from the Underground MM1 - Red Line - Duomo Stop and Underground MM3 - Yellow Line - Missori Stop. Within easy reach of all of Milan's Train Stations, the Fiera, both Rho Milano and Milano City, and all of Milan's Airports. For those coming by car, there is an underground Paid Parking facility in Piazza Diaz. For your added convenience, the Taxi stand is directly in front of BC Maison's entrance.